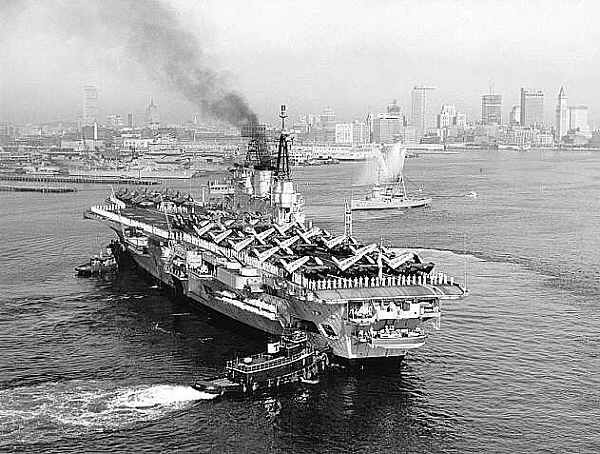 The fifteenth ship in the Royal Navy to carry on the name, she was the largest British Aircraft Carrier ever built. Laid down at the Harland and Wolff yard at Belfast in 1942 she was one of four Audacious Class ships to be constucted as part of the WW2 requirement. 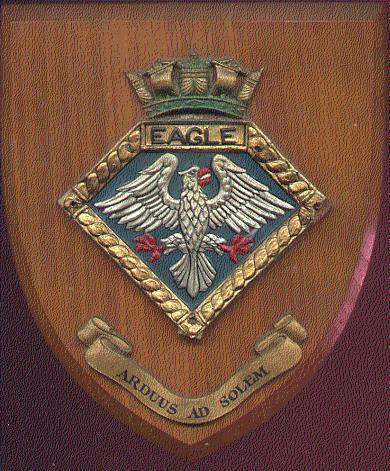 At the end of hostilities two ships were cancelled and she was launched as HMS EAGLE 19th March 1946. Her original name being HMS AUDACIOUS. She had a straight deck and remained so until her first refit in 1956/57. Commissioned 5th October 1951 she served until 1972 operating the very last Sea Vixen Squadron in Service 899 Sqn. Future major refits gave her a larger angled deck and the mirror landing sight in the period1959/1964. The accommodation was extensively modernised. Recommissioned in 1964 she was the largest ship in the Royal Navy. Unfortunately one of her propellors grounded on entering Plymouth Sound. (circa Autumn 1970/Spring 1971). It remained unbalanced for her future life and was the cause of her to be decommisioned in 1972 in favour of her sister ship. HMS ARK ROYAL to take the Phantom F4K. 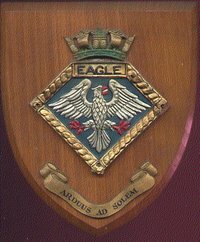 She was a far superior ship to the Ark Royal with regard to crew accommodation. Paid off in 1972 she was towed to Plymouth to be put in reserve lying in the Hamoaze. There she stood until 1978 acting as spares for Ark Royal. In 1978 she was towed to Scotland and the breakers yard. Archive: Lt.(P) Nev Lockett. RN.